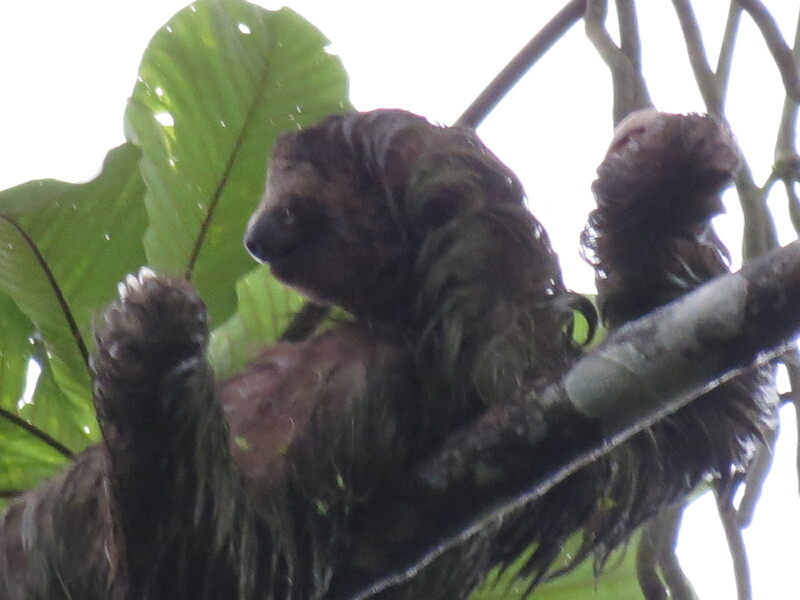 It is the rainy season in Costa Rica, there is no mistaking that! Each morning I wake up to rainfall. Or so I thought…I have discovered that what I am actually hearing is the water on the leaves from the night’s rain storms, dripping to the ground. But then it rains again by 7:00am. Rainforest leaves are generally large, with pointy tips where a water drop rolls down the leaf to the tip and then drips off. When there is a heavy downpour, I run for cover beneath a tree because the number of drops that will hit me is significantly fewer than if I were out in the open. Hooray for large leaves! It rains nearly all day and all night. There are different intensities of rain, from a mere mist to a sprinkle, to a steady stream, to heavy downpours and everything in between. When it rains, you experience all intensities, in a seemingly random order. Often there is a lot of thunder and lightening. 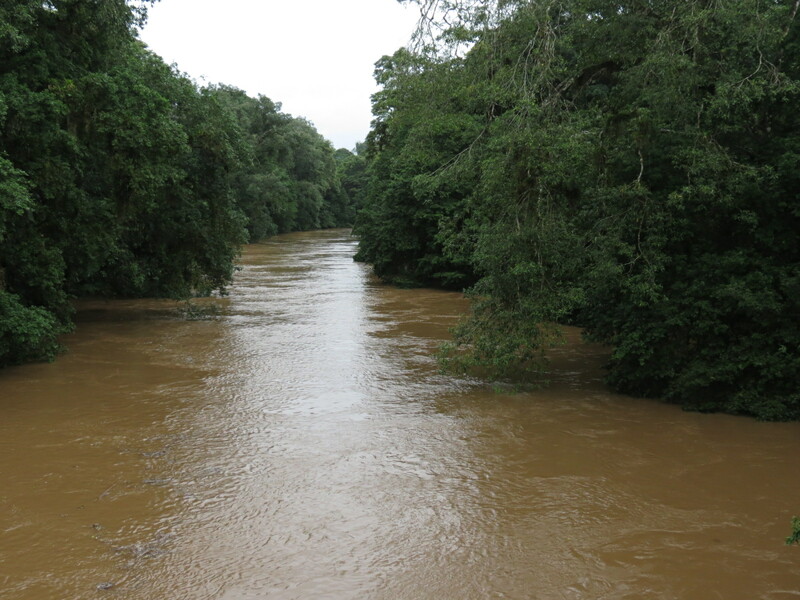 The Sarapiqui River next to my cabina rises and falls depending on where the rain has fallen (upstream or at La Selva). In a 10 hour period, the river rose a good 8 feet, but about 12 hours later it was back down where it had previously been. Flash flooding is not to be taken lightly here! Pools of water form above ground, creating ephemeral ponds waiting for a chance to seep down through the soil. The birds take cover in the trees but continue to call, the insects go quiet, and the monkeys sit tight on their branches and continue to howl as thunder rolls around above. I take my rain gear on and off half a dozen times a day, as I try to maneuver the drops between the dining hall, lab, and cabina. 10 minutes of sunshine lights up the forest and brightens our moods, and then the rain returns.